This article and the associated source code is an example of Google Play In-App Billing Version 3. The attached TestInAppBilling source code is a complete demo application. In the case of In-App Billing it is not possible to provide ready to run application (APK file). Each In-App Billing must have a unique package code and unique Google Play provided key. To obtain a license key you must have access to Google Play Developer Console. If you do not have access to the developer console you must register as a developer. Section 2. Installation goes through all the required steps to get the demo application up and running. The TestInAppBilling source code is part of Android Color Selector for Programmers application available on Google Play. The application is free. However, the user can purchase the source code of the application by using In-App Billing. If you download Android Color Selector go to the About screen to see the In-App buttons. A brief description of the Android Color Selector is given below. The Android Color Selector for Programmers application allows you to select a color from a color chart. The result of the selection is a 24 bit RGB color value. The application was designed to be called from another application and return the result to the calling application. If you develop an application that requires a user color selection, Android Color Selector is for you. You can also start the Android Color Selector manually by clicking the icon on your tablet. The result will be displayed on the screen. If you are an experience Android programmer you can skip this section. 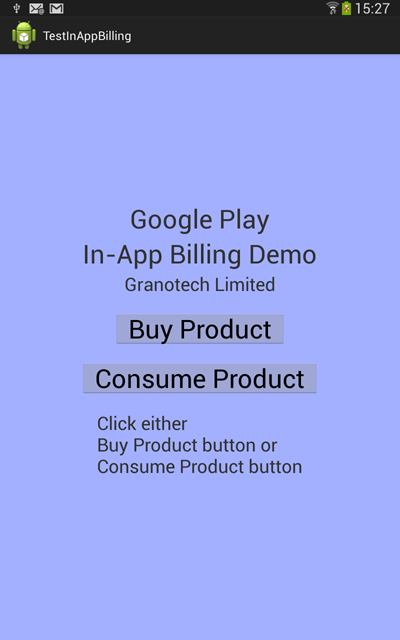 The only things you must do is change the package name from “com.granotech.testinginappbilling” to your own name, define on Google Play one in-app product with product0001 id, and copy the application key from Google Play to TestInAppBilling.java. You are registered as a developer and have access to Google Play Developer Console. You have installed Android Developer Tools (ADT) on your computer. You have an Android tablet with Google Play Store software installed. You have enabled developer mode and USB access on your tablet. You have enabled installation from unknown sources on your tablet. Your tablet has file explorer type software. If not, get one. If you know how to import existing Android code you can skip this section except for the package rename step. After the import you must change the package name from “com.granotech.testinappbilling” to a globally unique name such as “com.yourcompany.yourappname”. Extract the files from the Zip file to a temporary folder. Please note: the ADT import function will not work directly with the downloaded Zip file. If you want to load the project into empty workspace, you must add a new empty project to it. You cannot import a project to an empty workspace. This empty project can be deleted after you import the source code. Select Android –> Existing Android Code into Workspace. Click Next. Click Browse Root Directory button. Navigate to the location you extracted the project files. Click OK.
You will see TestInAppBilling project to import. Make sure to CHECK the “Copy projects into workspace” checkbox. TestInAppBillingActivity package was added to your Package Explorer. Rename (Alt-Shift-R) this name to a name of your choice. In the Package Explorer pane under src rename the com.granotech.testinappbilling to “com.yourcompany.yourappname”. You must change the package name to a globally unique name in order for Google Play to accept it. If Empty project was created, it can be deleted now. You can perform very limited testing in debug mode. You must go through the next two steps before being able to test the in-app billing. When you run it the first time make sure it is set as Android Application. Log into your Google Play Developer Console Account. Give it a title of your choice. For the purpose of this article we will use Test In-App Billing. Define one in-app product. For the purpose of this test, it must be a Managed Product with “product0001” product ID. All other information is not relevant to the test. Select Test In-App Billing application. Go to “Your license key for this application” and copy the base64 encoded RSA public key to the clipboard. Go to ADT and Edit TestInAppBillingActivity.java source module. Paste the base64 encoded RSA public key from the clipboard into applicationPublicKey string replacing the existing dummy key. Select Android–>Export Android Application. Click Next. Select TestInAppBilling project. Click next. If this is the first time, create keystore, otherwise enter the password. Create a new key or enter the password for existing key. Save your APK file in a production directory on your development computer. Go back to the Developer Console and select TestInAppBilling application. Click Upload new APK to Alpha. Drop your production APK file for upload to Google Play. When upload is done click save. Connect your tablet to your development computer via USB cable. Copy the production APK file that was created in step 2.4 above from your production directory on your development computer to a download directory of the tablet. Go to your tablet and look for the APK file. Click on it and install it on your tablet. You have two choices: buy a product or consume a product. First press the Buy button. The program will initiate buying process for the product that was defined in the Developer Console. Once you buy it you cannot buy it again unless it is consumed. To consume the product press the second button. If there is an error, you will get a message and error location. Error location is source module name, line number and method. The InAppBilling class does all the communication work with Google Play. This is the class that you will incorporate into your application to perform In-App Billing. The TestInAppBillingActivity is simulation of your own activity class for In-App Billing. The IInAppBillingService.aidl is Android Interface Definition Language (AIDL) file defines the interface to the Google Play service. The source code is provided by Google. Please note: you cannot change the name or package name assoicaited with this module. The package name must be “com.android.vending.billing”. Go to the following link to get all the information about it. Preparing Your In-app Billing Application. The InAppBilling class handles the in-app billing flow for purchasing, or consuming one item. To purchase an item you instantiate the class and call the startServiceConnection method. The purchase process is asynchronous. The startServiceConnection method initiates the process and returns immediately. When the process terminates, sometime later, one of the callback methods of the InAppBillingListener class will be called. The InAppBilling class is active from the moment startServiceConnection is called until any of the callback methods of InAppBillingListener is called. You can call startServiceConnection multiple times except when the class is busy. A call to startServiceConnection while busy will be ignored. parentActivity: the parent activity context for InAppBilling. In this demo project it isTestInAppBillingActivity. inAppBillingListener: a class implementing the callback methods to deliver the final result. The InAppBillingListener interface is described in the next section. In this demo project it is TestInAppBillingActivity. appPublicKeyStr: the public key assigned by Google Play Store tothis application in base64 format. purchaseRequestCode: request code for onActivityResult. The listener class must implement 6 methods. inAppBillingBuySuccsess(): The purchase process was successful. Add code to provide the customer with the product purchased. inAppBillingItemAlreadyOwned(): The customer already owns this product. No purchase request was made to Google Play. Do whatever is appropriate in this case. inAppBillingCanceled(): The purchase process was canceled. You can leave this method empty or provide some feedback to the user. inAppBillingConsumeSuccess(): The product was consumed successfully. In other words, the user can purchase it one more time. inAppBillingItemNotOwned(): The item is not owned. Therefore it cannot be consumed. inAppBillingFailure(String errorMessage): Unexpected error occurred. The error message has an appropriate text message plus the source code file name and line number of the error. In addition the method name is given. Please note: when any of the listening methods is called the InAppBilling class is no longer active. In other words, you can initiate another purchase or consume using the same object. itemType: The item can be ITEM_TYPE_ONE_TIME_PURCHASE = “inapp” for one-time purchases or ITEM_TYPE_SUBSCRIPTION = “subs” for subscription. itemSku: Item product ID exactly as defined in Google Play Developer Console. In this example it is product0001. consumeItem: For purchase it should be ACTIVITY_TYPE_PURCHASE = false. For consume it should be ACTIVITY_TYPE_CONSUME = true. Instantiate InAppBilling object by calling the constructor. You can reuse the object as long as it is not active. Call startServiceConnection method. This method will create a serviceConnection and bind it to Google Play Store service on the device. The binding process is asynchronous. The startServiceConnection will return immediately before the connection is activated. When the binding process is done the system will call the serviceConnected method. The serviceConnected method will test if in-app billing service is available on this device. Note: IInAppBillingService.isBillingSupported. If in-app billing is supported, the method will check if the item is available for sale. Note: IInAppBillingService.getSkuDetails. If the item is available for sale, the method will check if it is already owned by the customer. Note: IInAppBillingService.getPurchases. If the startServiceConnection was called for consume and the item is owned, the item will be consumed. Note: inAppBillingService.consumePurchase. If the item is not owned, the InAppBilling will terminate with a call to inAppBillingItemNotOwned(). If the startServiceConnection was called for purchase and the item is owned by the customer, the InAppBilling will terminate with a call to inAppBillingItemAlreadyOwned(). If the startServiceConnection was called for purchase and the item is not owned by the customer the program will send an asynchronous request to purchase the item. Note: inAppBillingService.getBuyIntent and startIntentSenderForResult. Please note: this is the time the customer will see the Google dialog asking the customer to approve the purchase. When the request was processed by Google Play Store The system calls onActivityResult method in that parent Activity class This call is transferred to onActivityResult method in this class. The onActivityResult method checks the result. There are four possible outcomes: (1) User canceled (2) Error (3) Result is ok but returned data is invalid (4) Purchase is successful. The appropriate callback method will be called. Whenever a callback methods is called, the InAppBilling class un-binds itself from the service, resets the active flag and then calls the callback method. The calls to IInAppBillingService.getSkuDetails(), IInAppBillingService.getBuyIntent() and IINAppBillingService.getPurchases() return more information than used in this demo. The information is in JSON key-value pairs. The InAppBilling.java source code identifies the extra information available to you if you need it. For more information got to In-app Billing Reference (IAB Version 3). The InAppBilling class contains two methods related to signature verification: verifySignature and decodeBase64. These methods are based on the sample project given by Google. However, both are much simpler. At the end of InAppBilling source there are a number of methods related to creation of error message. The getErrorLocation is of particular interest to C and c++ programmers because the method shows how to get the source module name __FILE__ and the line number __LINE__ of the error. The TestInAppBillingActivity class is a simulation of your own activity class. This is the activity that In-App Billing will be called from. Below you will find all methods defined in this class. For other members of the class please look at the source module. This activity creates the layout programmatically. We use RelativeLayout. Four views are added to the layout: title, buy button, consume button, and text message area. It is the Consume Product button on-click listener. It is the method that will initiate the consume product process. Listener callback method. Buy process was successful. Listener callback method. Buy process was canceled. consumed. He/she can buy it again. This callback will be activated when Google Play received customer authorization to go ahead with the purchase. Application is about to be destroyed. Make sure InAppBilling is disposed of. Google has extensive website for software developers. The following link is specific for in-app billing: Preparing Your In-app Billing Application. Android Color Selector for Programmers is a free App available on Google Play. PDF File Writer is a C# class library allowing .NET applications to create PDF files. PDF File Analyzer is designed to read, parse, and display the internal structure of PDF files. This project will give you the tools needed to compress and decompress files using the Deflate method of compression, and to read and write standard Zip files.